Latest post Tue, Oct 26 2010 5:10 PM by Tracy Granger ACE. 15 replies. Had a bizarre bunch of crashes today. It happened when I went into what I call "big timeline mode". 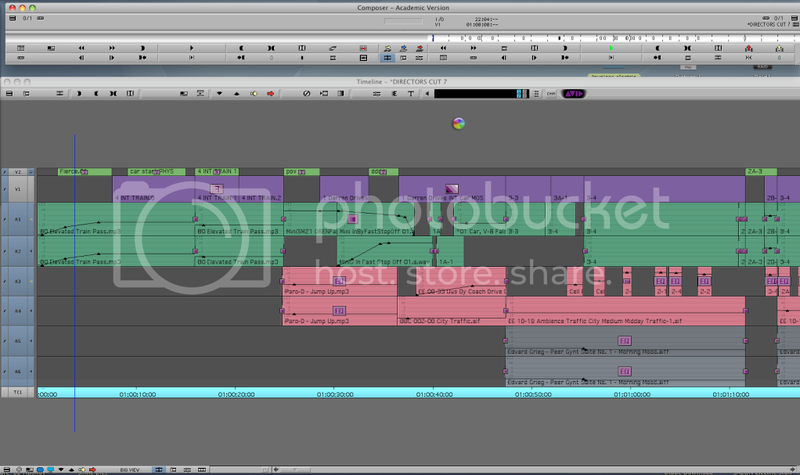 When I need to add alot of tracks and do a sound mix pass, I reduce the source and record screens to their play/ mark strips and make the timeline as large as possible. The problem happens when I try to play the timeline and watch the cut on my external Sony monitor: I got a spinning ball , followed by a crash. Have to shut down the computer w/ the power button and restart. I tried logging in with a new user setting. Same thing happened. As soon as I press PLAY, crash. All is fine when I have the source / record screens there..but NOT fine without them. I have 8 gb of Ram as well as Raid with over 3 Terabytes of storage. Can you please download the latest version (4.5.10 - .11 may be out by now, if so, go with that) and give it another try? That won't affect my Avid project will it? It was a bit of a drama getting this all to work. Also I forgot to mention, project is in HD. Project shot on Varicam (at 720p/25) which shoots 60 fps, and uses a frame flagging system to select 25 frames out of the 60. Avid project is 1080/50i. All new for me. So, I am cutting full resolution. That shouldn't be a problem though, as the timeline has being playing fine for a month, but in half size form. I can take some screen shots of the project settings if that would help. Is there a way to attch pics? I will go look for the upgrade now. On the DL center (avid.com/downloadcenter), look under "Editor Patches". The upgrade will not affect your projects or settings. BTW, if you are using software activation, don't forget to deactivate prior to uninstalling the app. Never installed a patch before so I am not sure what you mean by " deactivate prior to uninstalling the app"
But I will ask someone who does. Its 10 pm here in London so I will do this tomorrow. Is it Bug Number: UDevC00137617 ? Fixed in v4.0.5.3 ? In the Mac world, a patch for Media Composer is the same as a full version install. That means you must uninstall your current version before installing the patch. If you have a dongle, there are no activation/deactivation issues to attend to. If on the other hand, you have a software license, you must first deactivate the software license from the "special" menu inside Composer before uninstalling. Then, after installing the patch version, you reactivate your license during boot up. It's best to NOT choose the option to clear system ID and registration information when deactivating, if you're not changing platforms. The reactivation will go much faster and smoother. The Patch isn't a full version as it doesn't come with an Other Installers folder. Or any Read Me pdf's either. First I uninstalled everything like I have always done when installing a new version....but quickly realized that was not a good idea. I have spent 4 hours trying to get this to work, but can't. I used the uninstaller and even tried uninstalling all the apps in the Other Installers folder a few times. Nightmare. The Application crashed as soon as it started. Tried installing 3 times... last time got a Bus Error message. And an even longer Crash Report. Tried a few more times... then gave up. I had to uninstall that Patch and install my original Media Composer 4.05...which has this awful bug which won't let me play a big time line....and alot of other bugs too. Now I am back where I started. Why can't I just download a proper Updgrade to 4.0.5.10? Finally installed the Patch 4.0.5.10. Had to install a previous patch first. Turned off the Adrenalin. BUT THE TIMELINE PROBLEM IS STILL THERE! While trying to play sequence w/ supersize timeline (no source/record monitors) viewing the cut only on an external Sony monitor, I get a spinning beach ball crash after 2 or 3 seconds. Timeline plays fine w/ small timeline, showing both source/record monitors. Huge problem as I cannot add more sound tracks and do a sound mix. I have always worked this way...and its always been fine. This is a 1080/501 DVC pro HD project. Footage shot on a Varicam. Deck, a panasonic 1400. This workflow is a first for me. Maybe I need to download a DVC pro Codec? Can't find anything about this issue in Avid Community. Ok, first, please don't double post your questions. If your original thread needs to be updated, simply bump that thread or add to it to bring it to the top of the list. I did reply to your email to me this morning so give that a try and let us know how things work out. From your screen shot, it looks like "hide video" is active on your composer window. Right click on that window and make sure "hide video" is deactivated. Then reposition your windows and re-save your toolset. Trying to see if there's some corrolation between the hide video function and your system hanging. If so, try rebuilding the site settings files. To do this, quit the application, and from the settings folder delete the following: MC State, Site_Settings, Site_Attributes. On relaunch, the system will detect the missing files and build new ones. If you had previously dragged any user settings into the site settings window, those will need to be restored after the rebuild. Thought I'd let you know what happened w/ the crashing SUPER TIMELINE issue. [AVID Case : 01355590 Mac crashing on expanded timeline] Avid paid Technical support could NOT reproduce the problem. So they were never able to give me a solution. BUT, when I finished the project and disconnected the ADRENALIN .....the issue went away! Now I am able to edit the sequence in expanded Timeline. Everything fine! Now that the project is locked and I am finished cutting. I can't believe it. So much wasted time. I actually didn't even need the Adrenalin to edit after we were finished digitizing in the tapes.... I only kept it in case I need tech support from the place I rented it from because we had so many other technical issues! Oy ve! *** So now I am back to beginning..what could have happened between Media Composer and the Adrenalin that would caused such a thing? I need to find an answer before I start work again. Best Tracy in London.